Demon Child: Celestial Battle: Book Two - There Are Inkspots On My Page! 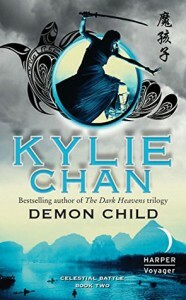 Kylie Chan is one of those authors that has burrowed right into my brain by writing books that I simply can’t get enough of. Demon Child is book 2 in the Celestial Battle trilogy, which is the 3rd trilogy to continue the story of these characters. And it is just as brilliant as the 7 books preceeding it. It’s very much a “middle series” book, everything is starting to ramp up, many plot lines are smack in the middle of their span, and not much is unexpected as far as the overall story goes. That doesn’t make it boring or predictable, however - the writing style and pacing keep everything nice and fresh. There are a lot of battle scenes in this one, but that’s the nature of the story. There are plenty of things going on around the fighting, including the introduction of a new and precocious character - I don’t want to spoil anything, but she’s adorable. On top of that, I love any time the Tiger comes out to play. If you haven’t read any of the previous books, I strongly recommend going back to the beginning and picking up White Tiger, although I take no responsibility for any addictions that may follow.